Adam Bryant conducts interviews of senior-level executives that appear in his “Corner Office” column each week in the SundayBusiness section of The New York Times. 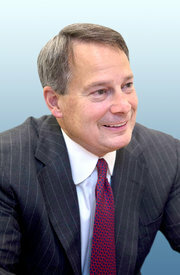 Here are a few insights provided during an interview of Walt Bettinger , chief executive of Charles Schwab. To read the complete interview, check out other articles, and obtain subscription information, please click here. Tell me about your early influences. I had the quintessential Midwest upbringing. Youngest of four kids, grew up in a small farming community in northwest Ohio, and there was a modest-size private university in town. My dad was a chemistry professor. Mom was a stay-at-home mom who was involved in volunteering at a lot of things around town. I worked almost full time at a grocery store for most of high school. How have your parents shaped your leadership style? I remember shortly after I graduated from high school, my dad came into my bedroom one Saturday morning and handed me a letter. It was his letter of resignation from the university, which surprised me. My dad was in his early 50s, and it wasn’t something you’d expect from a full tenured professor at his age. He explained that there had been some animosity between the professors and the administration, and that the professors had voted a union in. He said to me, without making any judgment about whether a union made sense or not, that he felt he had gone into teaching to be in service to others and that the professors were focused more on themselves than on the students. He just didn’t feel that it was in keeping with his principles, and so he resigned. He soon got another job at a different university, but it was just a bit of a shock to me in the moment. I’d always understood from my parents the concept of service to others, and the priority of what you can do for others rather than yourself. But to see it in action at 18 was powerful. It was just one of those examples of how a lot of people say a lot of things, but when push comes to shove, are your actions going to be in alignment with the principles that you espouse? What about lessons you learned in college? A business strategy course in my senior year stands out. I had maintained a 4.0 average all the way through, and I wanted to graduate with a perfect average. It came down to the final exam, and I had spent many hours studying and memorizing formulas to do calculations for the case studies. The teacher handed out the final exam, and it was on one piece of paper, which really surprised me because I figured it would be longer than that. Once everyone had their paper, he said, “Go ahead and turn it over.” Both sides were blank. And that had a powerful impact. It was the only test I ever failed, and I got the B I deserved. Her name was Dottie, and I didn’t know Dottie. I’d seen her, but I’d never taken the time to ask her name. I’ve tried to know every Dottie I’ve worked with ever since. It was just a great reminder of what really matters in life, and that you should never lose sight of people who do the real work.